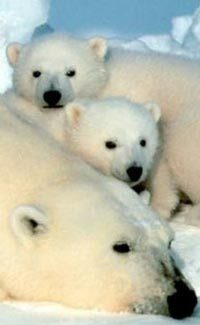 Enjoy our range of fun polar bears facts for kids. Learn what they eat, how much they weigh, where they live, how fast they can run and lots more interesting information. Read on and check out our cool trivia about polar bears. Polar bears have black skin and although their fur appears white, it is actually transparent. It is the largest carnivore (meat eater) that lives on land. Polar bears use sea ice as a platform to hunt seals. Seals make up most of a polar bears diet. Male polar bears can weigh up to 680 kg (1500 lb). Female polar bears usually only weigh about half as much as males. Polar bears spend most of their time at sea. Scientists estimate that there are around 20000 polar bears. The scientific name for the polar bear is ‘ursus maritimus’. Polar bears have an excellent sense of smell, with the ability to detect seals nearly a mile away (1.6 km). Polar bears can reach speeds up to 40 kph (25 mph) on land and 10 kph (6 mph) in water. The polar bear was the mascot for the 1988 Winter Olympics in Calgary, Canada.